Last summer, I spent time pouring over my grandmother's old family photos. She pulled out a couple albums that she inherited from her mother, who in turn inherited them from her parents. Both albums were quite remarkable because their contents were obviously the oldest of the family photo collection. 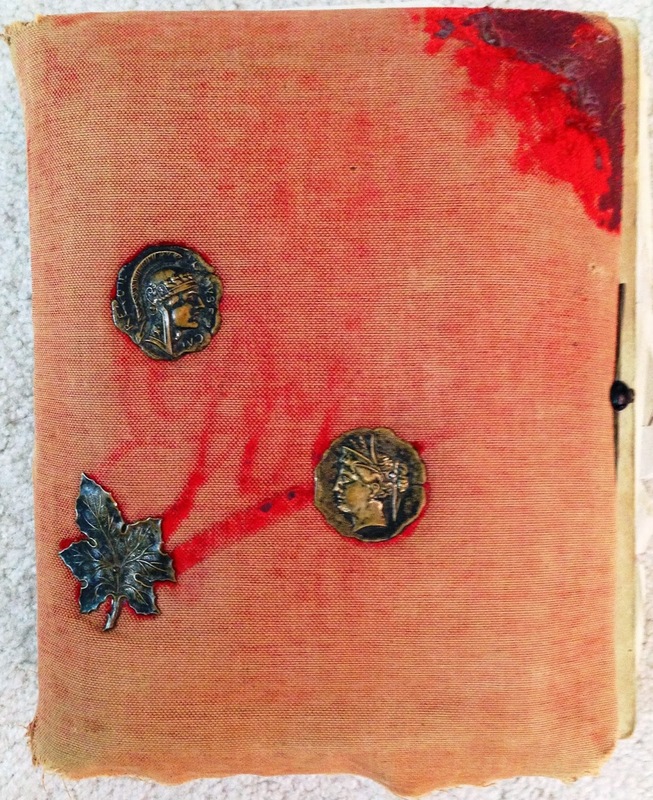 One of the albums had a worn cover that was once made of red velvet. Inside, it included a handful of cabinet cards from the late 19th and early 20th centuries. Unfortunately, many of the photos were not labeled, so the identities of the people pictured are unknown. The majority of the cabinet cards that are labeled feature Benedick family members. However, there are a couple cards of Dornon family members, and even one of the Bair family. 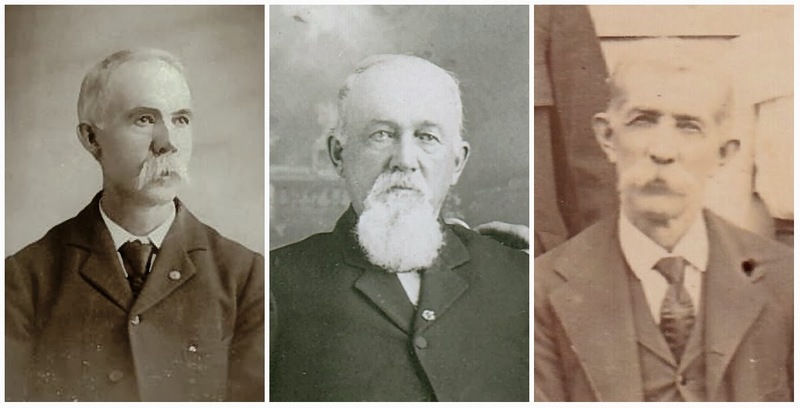 In trying to identify the other unknowns I've centered on these three surnames. Of the 30 photos in the red velvet album, two stand out from the rest. They are unlike the others in size and material. They are not printed on heavy card stock, but rather metal with a black tacky backside. The images look older and the clothing appears to be from earlier decades - perhaps 1860s. I believe the images are tintypes. Sadly, neither of the tintypes are labeled and my grandmother does not know their names. I can't even determine where the images were taken. Furthermore, the people in the tintypes don't appear in any of the later cabinet cards (at least I haven't been able to identify them elsewhere). The album originally belonged to my 2nd great-grandparents Ernest and Bessie (Bair) Benedick. I'm most curious about the woman. Is she one of my great-grandmothers? My aunt recently shared a letter that she received from a Benedick cousin in April 1988. The cousin, now deceased, was a descendant of Ernest's brother Albert Benedick. She wrote that she remembered seeing photos - in other family members' collections - of two of my 4th great-grandmothers. I've never seen photos of either woman. The cousin confirms that photos did in fact exist of Mary Ann (Miser) Benedick and Sophronia (Rogers) Dornon. They were the grandmothers of Ernest Benedick - the owner of the red velvet album. Is it possible that the woman in the tintype is Mary Ann or Sophronia? 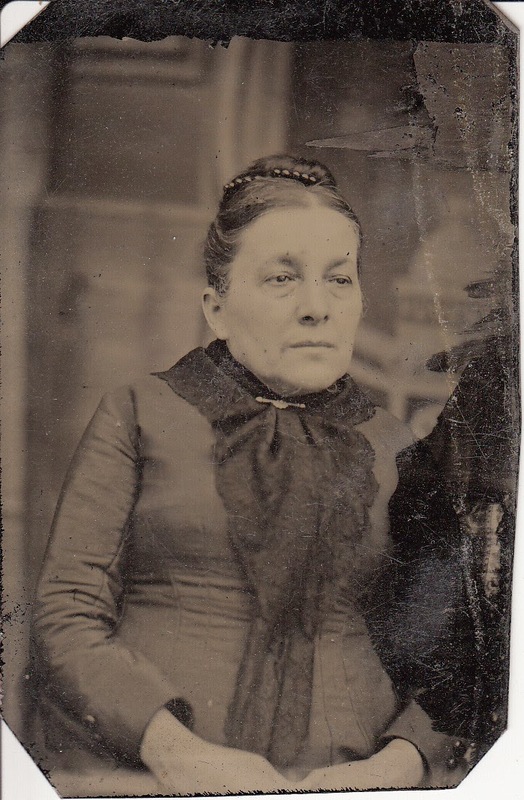 The woman in the photo appears to be in her 50s or 60s. Maybe even in her mid-60s. 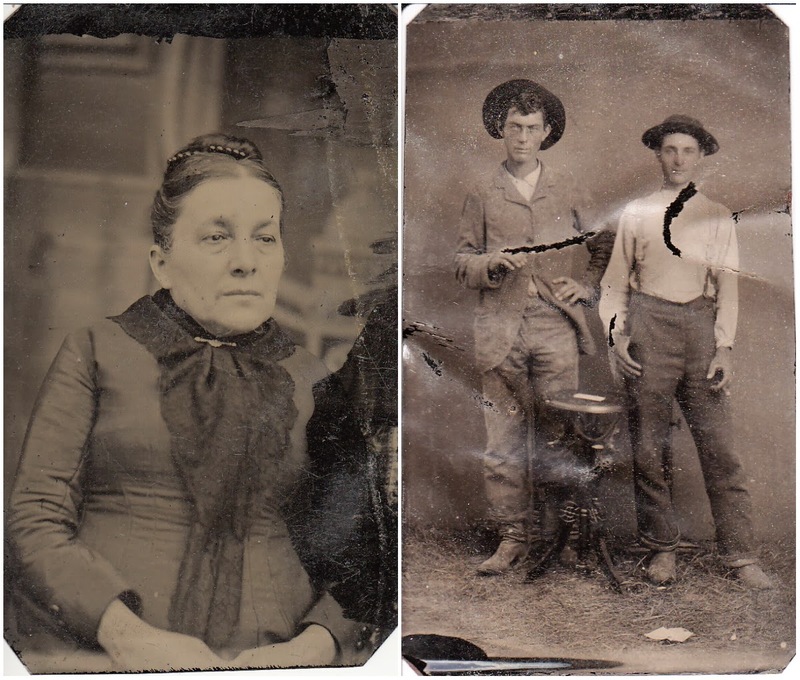 While I'm no Maureen Taylor (you know, the Photo Detective), I'm speculating that the picture is from the 1860s or 1870s. Let's say 1870. Based on this date and the speculated age span, that could suggest the woman was born between 1810 and 1820. Perhaps the scarf or hair style are indicative of a more specific time period or even suggest a geographic location? Is she wearing mourning clothes? Or is this just everyday typical fashion of the times? If we look at the two candidates under consideration, who - thanks to the letter - we now know were photographed, we can determine that each are within reach of the photo's proposed time frame. 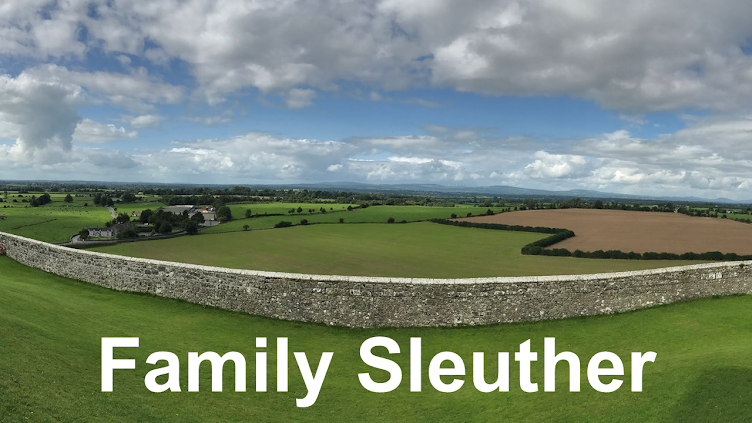 More information, though, is needed to help crack this case. Perhaps someone can pinpoint facial similarities to children of Mary Ann or Sophronia? According to her obituary, Mary Ann Miser was born March 26, 1809 in Harrison County, Ohio. She married John Benedick in October 1831. John died in 1863, and Mary Ann never remarried. By 1870, she was living with her son Samuel in Wyandotte, Kansas. She died June 4, 1901 in Plainville, Kansas at the age of 92. According to the 1850 and 1860 Federal Censuses and her grave stone, Sophronia Rogers was born in Massachusetts on May 22, 1815. It's believed that she married Burr Zelah Dornon in about March 1835. No marriage record has been located. She passed away May 23, 1872 in Wyandotte, Kansas. So, what do you think? Willing to wager a guess?